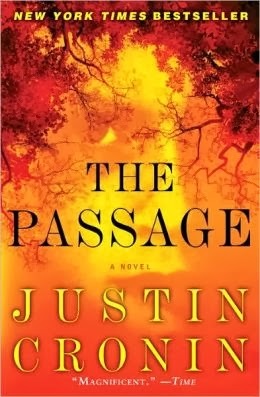 "The Passage" by Justin Cronin~The Best of Apocalypse Novels! USA Today has named The Passage as a must summer read: Booksellers across the country are buzzing about this novel, which features a jacket blurb by Stephen King. Film rights have been bought by Fox 2000 for Ridley and Tony Scott. You can find Mr. Cronin on Facebook and Twitter! Every once in ten years an absorbing, heart-stopping thriller comes along that keeps you reading for a non-stop week. "The Passage" is such a book. It's one of those books that you put everything in your life on hold to read because you can't wait to turn another page. It's one of those books that keeps calling to you even when you'd like to ignore it. "The Passage" is so addictive you'll lose sleep and forget to shower! I suggest you just block off several days for it right off the bat. it isn't. The book is just difficult to summarize...you've read those types. Although Amy is supposed to be the central character, I found myself more caught up in the adult survivors of the horrendous "experiment gone wrong" in their make-shift society. Cronin digs deep to give us vivid characterizations of people living and trying to survive in an impossible situation. The relationships they forge are tenuous at best, but loving and strong, nevertheless. It made me keep tracking with them, and it made me have hope for what could happen to us if we ever faced an earthshattering situation as a contemporary society. Cronin is an author whose time has come. He's the storyteller of our century with a tale that seems unbelievable and plausible at the same time. Think of Stephen King only more literary. You can't miss this one this year. I can't recommend it highly enough! I've already purchased "The Twelve." I enjoyed your review of "The Passage" it's one of the best I've read. Hope you're well. I start a new program with my cancer treatment next Friday. Thank God the budget on this wasn't cut. If you get a chance, please stop over at my blog and comment on the James Lee Burke review and if you have a good thriller that you recommend, let me know, if you want to send it, I'll pay the postage. (Other than "The Passage," which I've read. Dear Mike, I just finished my radiation treatments for a benign brain tumor that has made me go nearly deaf in my left ear. Fortunately, nothing else has been affected. I will send you any books I have that I think will be of interest.